Shu Uemura has launched over 40 new eyeshadow shades, and I've finally swatched all these new shades at last! 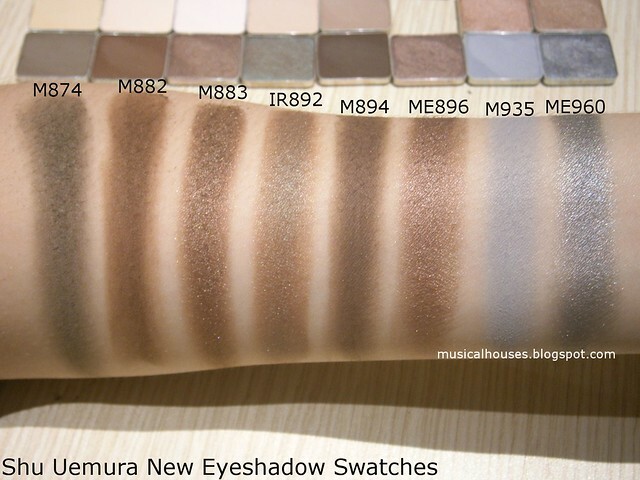 If you've seen my a previous Shu uemura eyeshadow swatch post,, then you've seen part 1 of the swatches, and today we'll be finishing up with part 2! In part 1, we swatched mostly colours, so now we're moving onto the neutral shades. So, if you liked browns, beiges, and greys, the swatches for those shades are all here! For those who aren't familiar with the shade names, the shade finishes are denoted by their names - M stands for Matte, ME for Metallic, IR for Iridescent, P for Pearl, and S for Satin. Generally ME shades have the most shimmery finish, followed by P shades and IR shades, followed by S shades (which are pretty close to matte, in my opinion), and lastly, with no shimmer at all, the M shades. Shu Uemura Eyeshadows: Over 40 new shades now launched! Anyway without further ado, let's move on to the swatches! M814 is a matte light beige shade, very useful as an all-over lid brightener. M816 is also a light matte shaded, similar to M814, but is a pink-based beige instead, and would serve a similar purpose. M818 is basically a matte white shade. I'm not sure if this is supposed to be white, or some sort of off-white shade, but it pretty much swatches white on me. M828 is a matte pink-beige shade, a hair darker than M816. M845 is a gorgeous, gorgeous shade of brown-based taupe. This is a great neutral shade that I could imagine seeing on a variety of skintones. ME853 (yes I know it says M853 in the original photo - I made an error!) is a metallic warm tan-brown shade that has an orange lean. P858 is quite similar to ME853 when swatched on me, except less orange. It's also a light tan metallic shade, like a copper penny. M874 is a lovely neutral shade, a brown-grey deep matte. M882 is a matte deep neutral brown. Like M874, these are good workhorse shades for a crease colour. This particular shade could also work for filling in brows. ME883 (oops another error - this is what happens when you edit a whole bunch of photos at once) is a metallic deep neutral brown with a chocolate undertone. This is gorgeous, I tell you, absolutely gorgeous! IR892 is a lovely brown shade with a green irisdescence. This shade is sort of similar to MAC Club, if Club was lighter. The iridescence is also less obvious in this shade, and is just a hint. 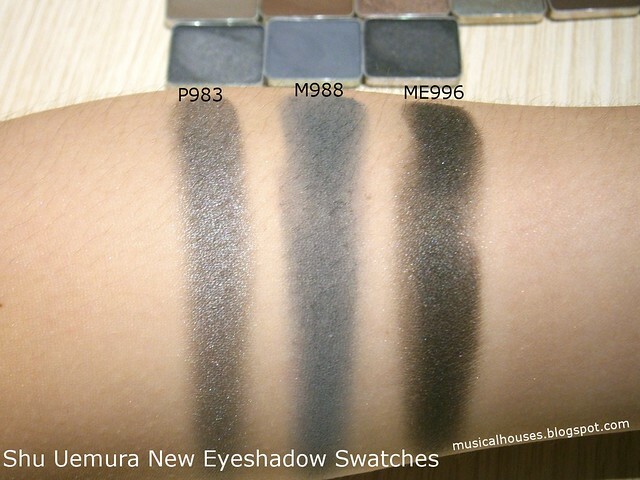 M894 is a deep brown matte, less red than M882, and more grey. And like M882, it also works for a variety of uses - crease colour, brow colour, and so on. ME896 is a shimmery deep brown with a neutral undertone and a metallic finish. This is quite similar to ME883, but I think a hair darker. M935 is a matte light grey shade that reminds me of concrete. Unlike a lot of greys, this one doesn't pull too blue on me. ME960 is a stunning, metallic silvery gunmetal medium grey shade. It looks so nice with the silvery foiled finish! P983 is a shimmery deep grey, that looks more black in the pan than it swatches on me. On my skin, this looks like a deep grey, but not a blackcend grey. M988 is a cooltoned deep blue-grey. ME996 is basically a shimmery black. Or at least, it looks like black to me - it could be an almost-black grey shade, but when swatched alone, it just looks black. As usual, the pigmentation on these shades was generally excellent across the board. 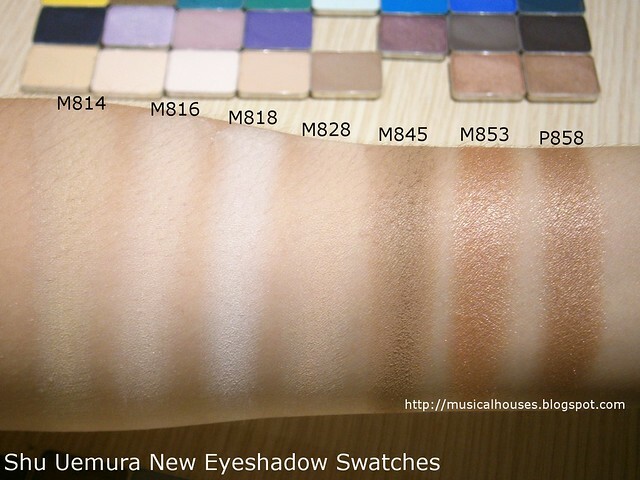 Shu Uemura eyeshadows are something of a cult product from the brand (along with their cleansing oils), so I'm not surprised that the quality is good. Shu Uemura's eyeshadows work on a modular system - you buy the individual pans, and can buy palettes to put your eyeshadow combinations in. For the launch of these eyeshadows, the Shu Uemura website has a pretty cool function where you can upload any photo of your choice (from your computer, Instagram, etc.) to their site and get a recommended colour palette to recreate the key colours and moods in the photo, so you can check that out and play around too. Oh my! I have seen the part 1 and now these...I def agree that this palette is something worth owning for.